This article was posted on January 1, 2004. Most of the very early retirees I know have no shortage of things they'd like to do besides working. Their problem is finding the time to do all the activities that interest them. However, for retirees that find themselves at loose ends, Creative Retirement offers twelve strategies and more than 80 different projects you can tackle to fill time in your golden years. First author Rob Kelley outlines his "twelve strategies" such as "Go Out Once a Day", "Plan Ahead", and my personal favorite "Reduce Your Food Intake (Unless you wish to look like a hippopotamus.)" It's a good list of things to consider. Next Kelley explores how retirement affects your relationships. For example, he reveals that the divorce rate shows sharp spikes at two times during one's lifetime -- right after marriage and right after retirement. Certainly a pothole well worth avoiding since a divorce might propell you screaming back to the workforce. 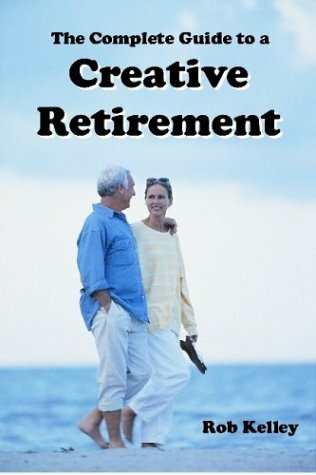 Click here to order Creative Retirement Today! His chapter on "Changing Your Lifestyle" was very interesting. Many people make ill considered moves to "retirement areas" only to incur the expense of moving back home when they decide they don't like it. I was particularly intrigued by the Arizona couple who bought a "sixty-foot motorhome and for several months each year, they drove all across America sight-seeing and visiting relatives." The largest RV I've ever seen was a 45-footer. A 60-footer must be a sight to behold. The remainder of the book lists "80 exciting projects", most of which sound like a lot of work to me, but I realize many people like to keep busy in retirement. Several of these "projects" caught my eye. House swaping and the only home exchange website for those over 50 www.seniorshomeexchange.com, "Indoor Walking" for apartment dwellers, and being a delivery driver for a pharmacy. For those interested in improving their standing in the community, Kelley points out that one's social status as a pharmacy driver is much superior to pizza and restaurant delivery drivers. All in all an interesting book. The worksheets on "Changing Your Lifestyle" may be worthwhile for those dissatisfied with their current routine, and who knows, maybe one of the 80 projects will strike your fancy and open up a whole new world to you in retirement.